Harlington Village at HarlingtonVillageThe village of Harlington sits on the southern edge of the district, bordered by an area of natural beauty including the chalk downs of Sundon Hills Country Park and the vale of the River Flit. Half-timbered cottages dating from the 15 -18th centuries climb the hill to the 17th century manor house (Harlington House) and the Church of St. Mary the Virgin. The church is of the early 14th century with a Perpendicular tower. The south wall of the chancel has a small stained glass window depicting scenes from The Pilgrim's Progress. The village of Harlington sits on the southern edge of the district, bordered by an area of natural beauty including the chalk downs of Sundon Hills Country Park and the vale of the River Flit. John Bunyan is strongly connected with the village. It was here that Bunyan was arrested for leading a meeting at a nearby farmhouse and taken to Harlington House. Bunyan was then questioned resulting in his imprisonment for unauthorised religious gatherings. 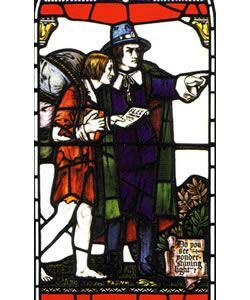 It was whilst serving his 12 years sentence at Bedford County Gaol that John Bunyan began writing The Pilgrim's Progress.